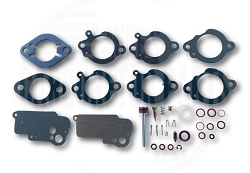 Stromberg EX-22, EX-23, EX-32, EXV-2, EXV-3 carburetor rebuild kit. New, currently produced. Apply a few drops of oil to the leather cup before installing. Hello, Just want to let you know that the above mentioned carburetor kit arrived in perfect state at my home address on thuesday, 30th August. It looks just great and included are the parts that I was searching for about 4 years in Europe and did not find until now. For instance I looked for a new gasket for the fuel bowl, a new mixture screw, a new piston for the acceleration pump, and a new float needle. I will fit the parts as soon as possible in the carburetor of my car, a 1934 Renault Vivaquatre. In gratitude, the webmaster of our club will put your link on our website www.aroc.be (Antwerp Renault Oldtimer Club). You can find pictures of my care on it. I will surely keep you posted about the running condition of my car with the fitted kit. Kind regards, Werner Bruyninckx, treasureholder AROC, Belgium. It work perfect. We had the kit installed and running like a champ. I passed your card on to some friends. Q: Hello, I am needing carburetor rebuild kits for a 1936 Pierce-Arrow 1603, with two EX-32 carburetor. I have been told the jets need to be updated to compensate for ethanol fuel. Do these kits come with new jets? Thank you. A: I'm sorry but we don't have an EX rebuild manual available at this time. Q: Hello I have a Stromberg EX-32 carb that has been took apart and cleaned by another person and brought to me in pieces. 2 questions for you. I have an extra spring that I can not determine the location of. Is there a cone shaped spring that goes under the accelerator pump? And my rebuild kit calls for 3 brass washers on top of pump shaft which I did not receive in kit are the available separately? My kit was a Daytona 3501 for EX series carbs. Thanks in advance Brian. I don't have very extensive info on the EX carbs but I do not see a cone shaped spring in any of the diagrams I have. Q: Could you give me a price for shipping this kit to UK please? Thanks. A: We ship internationally all the time, that isn't a problem. To get an accurate quote, add the items you want to your cart and enter your shipping information on the checkout form. You'll receive quotes for US postal system and UPS.